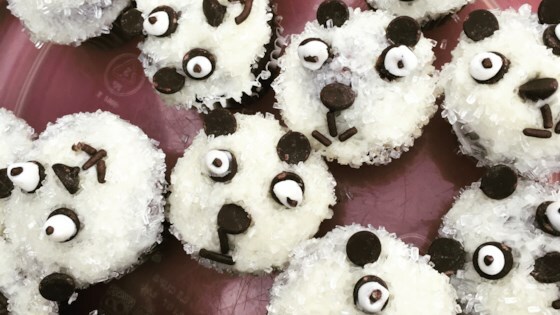 "These chocolate mini cupcakes are decorated as little panda bears. The proportions work best for mini cupcakes." Preheat oven to 375 degrees F (190 degrees C). Grease one 24-cup mini muffin tin and one 12-cup mini muffin tin or line cups with paper liners. Sift cocoa powder into a large bowl and add 5 tablespoons boiling water. Stir into a thick paste, adding more water, 1 tablespoon at a time, if needed. Add 3/4 cup butter and 3/4 cup plus 2 tablespoons sugar and beat with an electric mixer until smooth and creamy. Beat in eggs one at a time, beating well after each addition, until batter is smooth. Mix flour and baking powder in a bowl and stir into the batter until well combined. Spoon batter into the prepared mini muffin cups using an ice cream scoop, filling each 2/3 to the top. Bake in the preheated oven until tops spring back when lightly pressed and a toothpick comes out clean, 10 to 12 minutes. Allow to cool in muffin tin for a few minutes; transfer to wire rack and cool completely, about 30 minutes. Combine cream cheese and 1/4 cup butter in a bowl; beat with an electric mixer until well combined. Mix in vanilla extract. Stir in confectioners' sugar gradually. Frost each cupcake with a layer of white frosting. Pour white sparkling sugar into a small bowl and dunk each frosted cupcake into the sugar, so the frosting is evenly covered. Place 2 chocolate chips into the middle of each cupcake for the eyes with the pointy side facing the cupcake. Place 1 chocolate chip with the pointy side pointing down for the nose, like an upside-down triangle. Make a mouth with 3 chocolate sprinkles in the shape of an anchor. Place 2 chocolate chips on top of the cupcakes for the ears. Roll fondant into tiny balls for the eyes, smaller than the mini chocolate chips, and stick 1 half piece of chocolate sprinkle into each ball for the pupils. Glue eyes onto the 2 eye chocolate chips with some frosting. If you don't need that many mini cupcakes, just make the amount you need and bake regular- sized cupcakes with the rest of the batter. You need to adjust the baking time, probably more like 20 minutes, just keep checking with a toothpick. You can also use small sugar eyeballs instead of making the eyeballs out of fondant yourself.